Once again, we want to thank our fans, our speakers, our volunteers and our partners. Without any of you, we don’t have a show, without any of you, we’re not able to continue to follow the passion that drives us to continue creating these FEAT shows. So let’s recap FEAT Canada! After an extraordinary day where FEAT Kids took the stage in the afternoon, the night started off with an acrobatic act from the Vancouver Circus School. 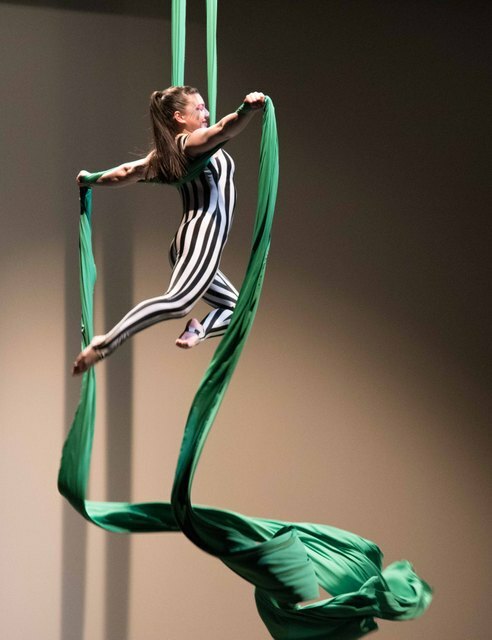 After the FEAT introduction song, Brittany Gee-Moore stepped on to the stage to perform an acrobatic demonstration on the ribbon. After the circus school’s demonstration, FEAT Producer and Director, Sean Verret, took the stage to introduce the MC for the evening Kevin Vallely. Kevin, who previously spoke at FEAT, and also MC’d last year’s show was excited to host this year’s show. 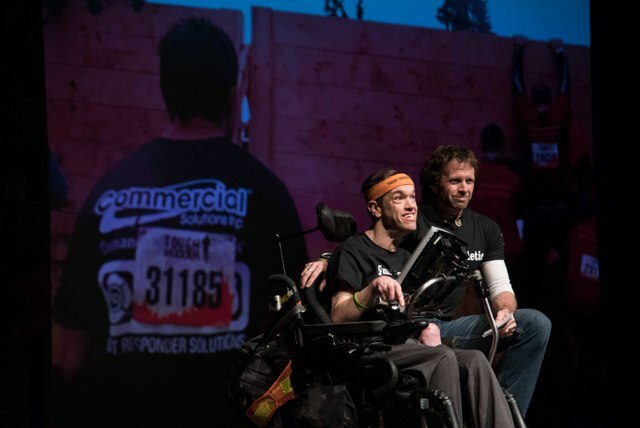 The first half of the show featured tough mudder’s Jason Cole and Rand Surbey, adventurer Peter Marshall, writer and outdoor enthusiast Sue Oakey-Baker and stand-up paddle boarder Bob Purdy. 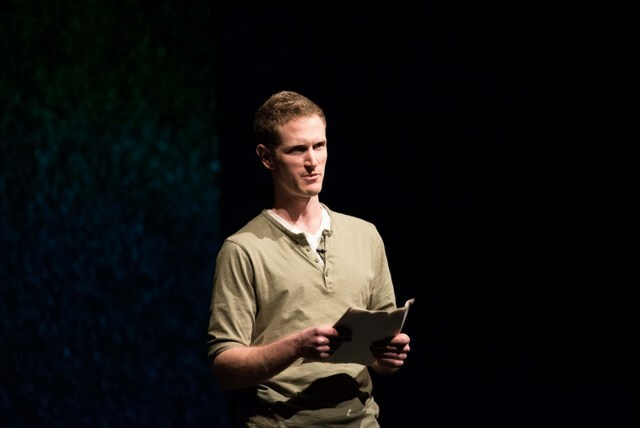 In late 2010, just weeks after his wedding, Peter Marshall became critically ill and was diagnosed with a rare and incurable autoimmune disease. The disease scarred him with a compromised immune system, permanent damage to his lungs, and a long road to recovery. 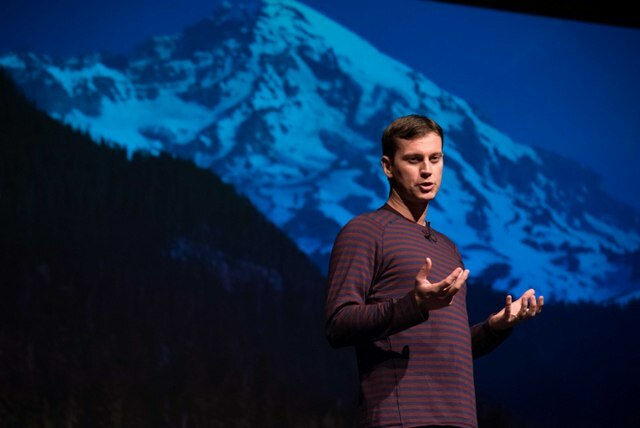 To raise awareness of his rare condition, in July 2013, Peter completed a self-supported cycling, skiing, and climbing trip from Vancouver to the summit of Mount Rainier and back. Peter talked about his adventure, the difficulties in getting started and the problems he had along the way. He described his surprises and his discouragements. He explained the difficulty of going uphill on his bike and the demoralization he felt. In the end, however, he continued on and he conquered the adventure that he had set out for himself. Bob Purdy finished off the first half discussing his Paddle for the Planet mission and how the first ten days were some of the hardest days of his mission. He discussed the 10th day of his mission and how hard it was on a day with a forecast high of minus 7 and how hard it was that day. It was so hard that the “perfect storm of quit” hit him. He was done. He experienced a giant meltdown and stared into space. 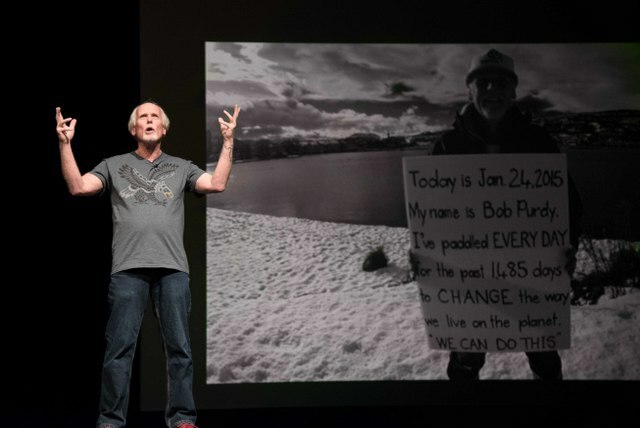 Eventually, he packed up and he took to social media and talked to his wife and said that “Paddle for the planet was finished.” Bob was surprised, however, by the support and encouragement from the world and he decided to persevere. 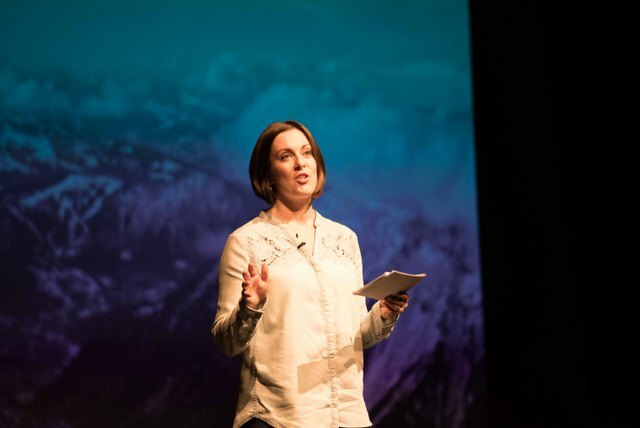 The second half of the show featured skier Steph Jagger, cyclist Gavin Kennedy, climber Vikki Weldon, adventurer Frank Wolf and an encore presentation from traveler Andrew Warner. Gavin Kennedy road his bike on to stage and started by explaining a conversation between him and a Mexican military soldier in broken Spanish. He was looking for a place to camp, the soldier asked him if he wanted to see the turtles. Gavin said yes, and his adventure began. He set up his tent in a refuge, met with a biologist and was lucky to hold an egg of what would eventually become one of the biggest turtles in the world. He got to help tip the turtles from baskets into the ocean as seagulls watched nearby. He said goodbye and left the beach wondering about the next journey for the turtles. 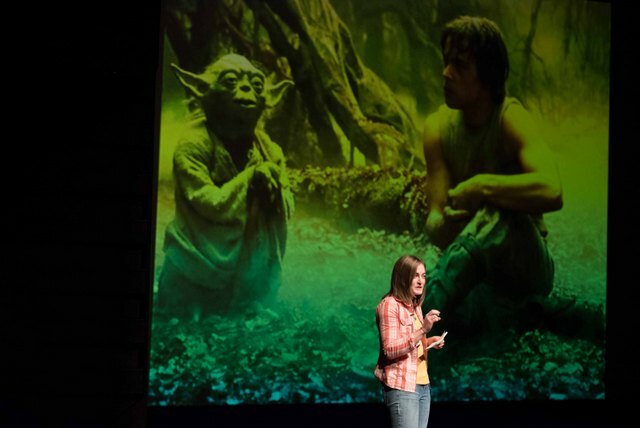 Climber Vikki Weldon started talking about those who guide us who are different from our idols. She talked about her role models starting with her brother and others who taught her how to climb and how to try your hardest and believe in herself. 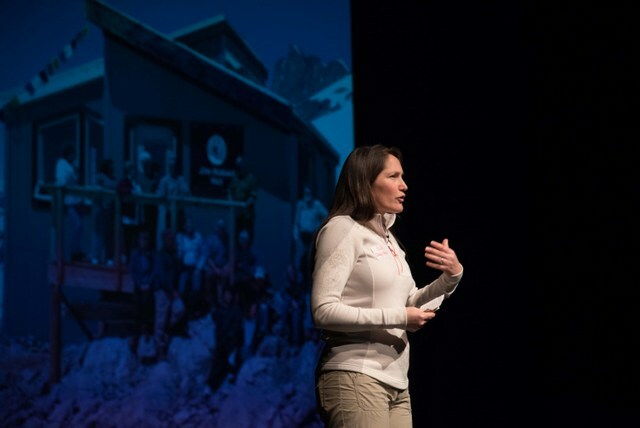 She talked about her next endeavor and creating a new multi-pitch sport climbing route. Her mentor Paul taught her everything she needed to know and told her to “keep moving.” She continued to learn and explained her hard times, fumbles and tears. She had set the route and she was ready to try her new route out and she completed her very first “first ascent”. She finished with how her mentor Paul helped her establish her first “first ascent” and explained how mentors are so important for us reach our full potential in any sport. Adventurer Frank Wolf opened explaining some of his self-propelled expeditions in Canada. 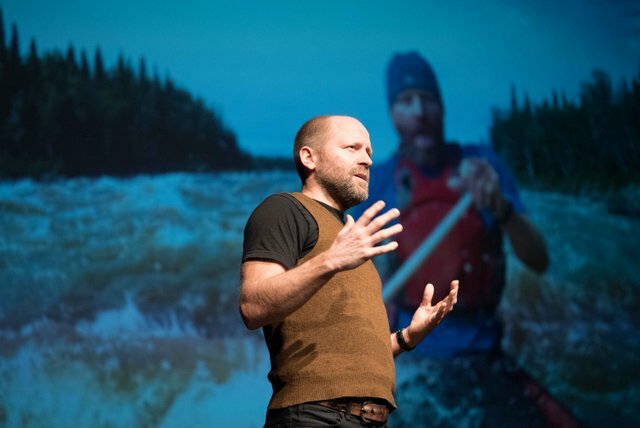 He gave a humorous talk about his films and some of his adventures and expeditions. He explained the various “third man” experiences like the great Canadian snow leopard, the mansquito and the sasquatch. 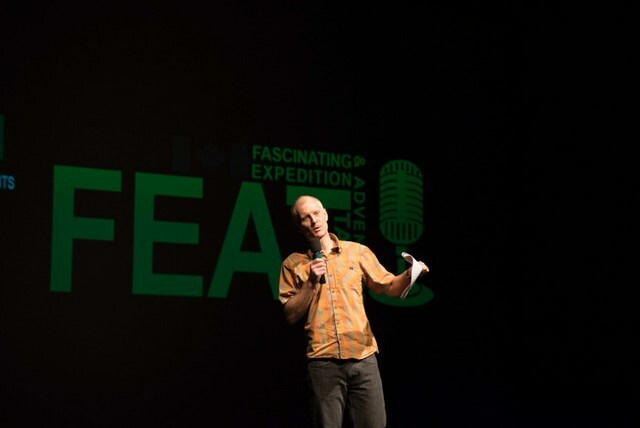 In an encore performance from FEAT Kids, Andrew Warner was invited to also talk at FEAT Canada. 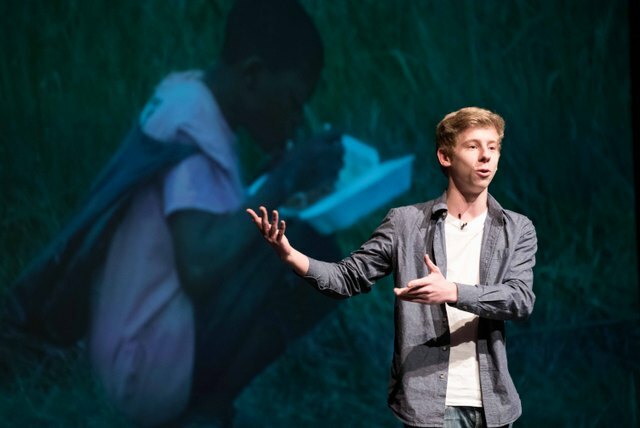 Andrew, using spoken word, explained his experience in Haiti and his new understanding of empathy. Andrew wowed the audience and finished the show with a second standing ovation in a day.